Little Chef was once the biggest of all Britain's roadside names. For almost 60 years it has catered for families on the move and making a good attempt to attract local residents too. It was the golden child of its owners Trusthouse Forte, which was then seized upon by Granada who grew it to become a 439-branch mega-brand. What followed was a slow and painful decline, with 15 years of headlines about financial difficulties and mass closures as the chain was thrown between passionless owners who each had a completely different strategy. In February 2017, Euro Garages purchased the company's restaurants, but only wanted a year's use of the name, which is owned by Kout Food Group. Euro Garages began a programme to replace all the restaurants with other brands such as Starbucks, but in a metaphor for the company's history, the process was hit by issues and suspended. Instead they spent January 2018 hastily removing all references to Little Chef from the few remaining restaurants, and continued throughout 2018 as EG Diner before being totally refurbished to become fast food units. Little Chef have had a huge cultural impact, often owing to their negative public perception from the past. There is a long-standing joke that Little Chef's chain of restaurants pre-dates the British road network. This joke lasted a lot longer than their restaurants. As of October 2018, the Little Chef website is still advertising restaurants that closed two years ago, causing confusion. Inside a typical Little Chef restaurant, left largely untouched since Granada. As detailed in its history, Little Chef experienced many different expansions, takeovers and refurbishments, which meant that there was no precise restaurant design. Even so, the brand did aim for consistency, with each restaurant having a waiting point and till by the door, where there was often a very small shop. There would be a counter at the side, and free toilets even for non-paying customers. There would be a sign by the main road listing what was available. Most restaurants would be next to main roads, a hotel (Little Chef Lodge/Travelodge) and a petrol station, often with a Burger King-franchise on-site. Discounts would be provided for lodge guests and registered 'friends' of Little Chef. For many, it was a name associated with family holidays, and branches sprung up on the way to Cornwall, The Lake District and across Scotland. They also experimented with restaurants across Europe, in UK airports, shopping centres and railway stations. Several takeaway options were introduced, the most extensive being part of the Wonderfully British refurbishment. While Little Chef changed its menu regularly, it maintained the same format with some established breakfasts, deserts, and a range of hot drinks. Hot drinks were later branded Lavazza and Miko. Most restaurants were licensed until 2017. Little Chef's breakfast menu featured two particularly well-known items: The Early Starter and The Olympic Breakfast. The latter was introduced in 1994 and became a firm favourite, lasting through to the end and withstanding a controversy over its name during the London Olympics. Their deserts included the Jubilee Pancake. 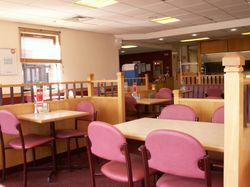 As a chain aimed at families, Little Chef were particularly well-known for their facilities and offers aimed at children. A smaller childrens' menu was made available, and high chairs and baby food were provided. As Little Chef became larger, to maintain consistency the chefs were often given strict instructions to follow. This changed for the menus designed by Heston Blumenthal, as he put the emphasis on the quality of the meal and how it was served. A wider variety of food was available for a while at places designated Little Chef Choices, and a lesser menu was available at Little Chef Express. Hot drinks were served variously under the names Coffee Stop, Café Nescafé, Coffee Tempo! and Lavazza. Little Chef restaurants were styled to look like classic diners, with low-hanging lampshades and individual chairs and tables. There was usually a red carpet on the floor and curtains over the windows. The restaurants designed by Heston Blumenthal were the very opposite of this, with their shiny floors and their chrome finishes. Little Chef's logo was nicknamed 'Fat Charlie'. It was revised and shrunk roughly every 10 years. It had been suggested that his portly figure was putting off customers, but attempts to slim him down have proven unpopular. In 2009, a permanent revision was made, replacing his neckerchief with a proper chef's jacket. One of the early logos, used in the 1970s. The rounded logo, used in the 1980s. The next Little Chef logo, used between 1993 and 2008. This logo was used between 2009 and 2011. The final Little Chef logo, used from 2011. Fat Charlie was made available in many forms of merchandise. In 2002, the Thame restaurant had the font on its logo changed to use a more friendly, cursive font. The new branding wasn't rolled out until 2011, where the Wonderfully British refurbishment included a cursive font. The buildings were painted bright red as part of this. The website was updated with each styling. Buildings initially had a flat roof with large windows. They then moved towards a pitched roof (with fake roofs being retrospectively added), with red-brick walls, and finally grey-pan tiled roof with lightly-coloured bricks. During the blue phase, buildings were painted almost entirely blue. Most of these were changed back. Their smallest restaurant was at Eye Green, which was one of two restaurants which were built into Travelodge hotels to save space. Other distinctive branches included Wansford and Markham Moor. One signature feature of a Little Chef was the tall, thin lighting columns in the car parks, dubbed 'mini milks' after the ice cream. These still survive in many places across the country. 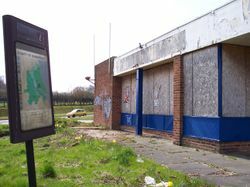 Little Chef came to be known for its abandoned branches. Little Chef started with one restaurant and quickly grew by opening new branches and taking over rival firms. Once it hit its peak, it suffered at the brutal end of retail, as it was tossed between disinterested owners who were determined to make as much from it while putting as little in to it as possible. The chain has been owned by two major motorway operators. As consumers demand began to change, these companies started worrying about their own catering and left Little Chef to weather the storm on its own. As it entered terminal decline, several well-intentioned efforts to save Little Chef weren't enough to prevent the number of branches falling in great chunks until there were none left at all. Restaurants have gone on to become coffee shops, fast food joints, independent diners and the occasional adult shop, but the majority will be cleared to make way for something completely different. In the 1980s, Little Chef ran a series of TV commercials, focusing on the variety of the menu. These adverts then began to direct themselves at families, promoting offers such as two meals for £4.99 and free meals for children. In the 2010s, offers and competitions began to move online. Prior to this, a series of promotional postcards were produced, showing the Magnificent Big 7 Burger and the slogan "it's summer, it's fun, it's Little Chef". Badges were also available showing Fat Charlie in various forms. Like many brands, Little Chef sold many special atlases with their branches highlighted over the years, which have been made widely available. Little Chef's most famous souvenir were the red lollipops which were provided to children (and like-minded adults) after every meal. A special, yellow edition was briefly produced. Other products would be available in the retail shop. Slogans have included "you can trust Little Chef", "unsurpassable", "we get it right", "a Little Chef goes a long way" and "Little Chef; big choice". These days, a lot of Little Chef memorabilia can be purchased second-hand online. Due to their new owners' desire to convert the estate quickly, even furniture would turn up on online auction sites.